This 14K gold dancing unicorn charm pendant from Apples of Gold Jewelry is the perfect pendant to help you get in touch with your childhood! Made from 14K yellow gold, this pendant measures 7/8" tall by 9/16" and weighs approximately 1.76 grams. The pendant features a happy unicorn dancing, with its front legs raised in the air. The details on the unicorn's tail, mane, and horn really make this pendant extra special. The pendant is made in the U.S.A. and will look stunning when paired with your favorite chain! 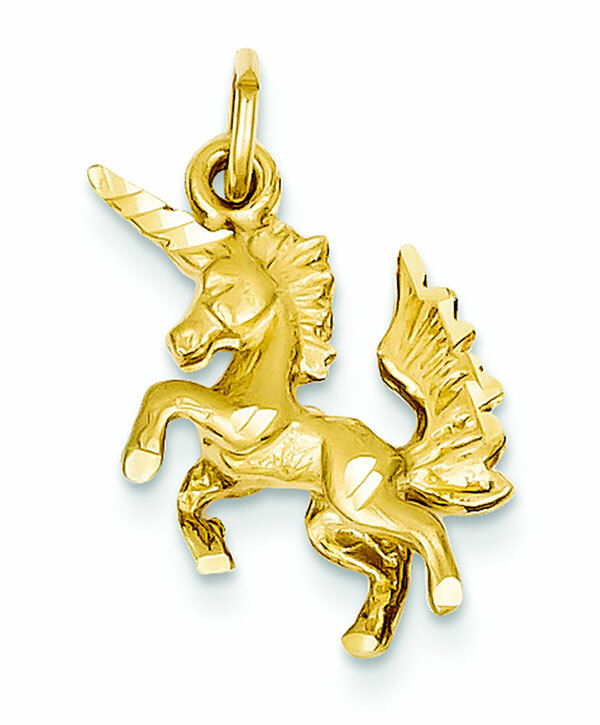 We guarantee our 14K Gold Dancing Unicorn Charm to be high quality, authentic jewelry, as described above.